Short online courses with compact learning chapters enable you to learn business skills faster than ever. All courses are 100% online and self-paced. This enables you to start studying right away. No formal requirements: our courses are open to all nationalities, ages and professions. 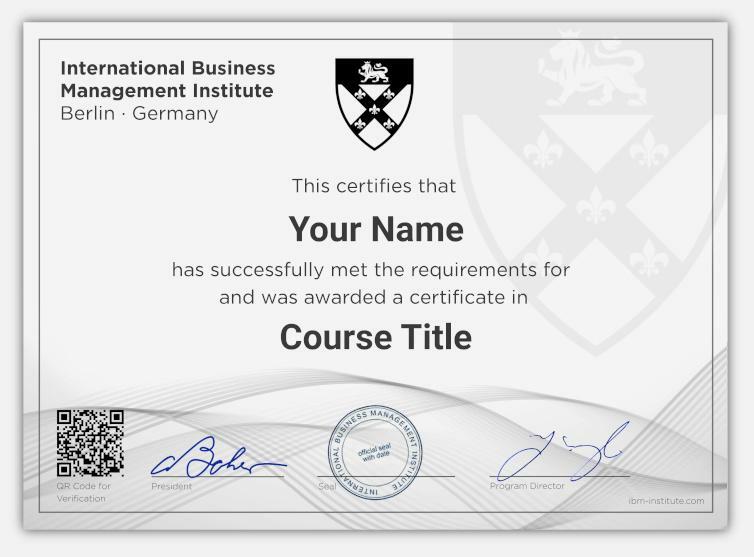 You will receive a highly valued digital certificate at the end of each course. Complete a track of several courses and receive a program diploma free of any additional charge. Showcase your newly acquired knowledge and business skills to employers. Excellent courses! I love the easy explanations. Lessons are very short, no time wasted on unnecessary stuff. In my job modern business skills are vital. Since I am very busy, I needed to learn the essentials very fast. Great! Easy to follow and implement. Very good and detailed examples. Highly recommended! Courses are short & simple! Very informative and helpful! I can't wait to do my next courses! Thank you so much for this great opportunity! I learned a lot about modern management topics. Really good basic courses. Content is easy to understand. Perfect for beginner and intermediate levels. Perfect, all the information needed is available. Topics were broken into meaningful and digestible chunks. Loved it! Easy to follow! Lessons were very detailed and short. Very good and detailed examples. The business management program was very informative & helpful. I learned a lot and I am glad I took the courses. Really good basic course. I learned the fundamentals of project management at a time and place that suited me. I studied at home, in my office, really anywhere – whenever I wanted to. Perfect flexibility and perfect workload. This was for me the best way to receive an affordable business certificate. It’s now part of my resume. Really interesting, offering great tips and excellent advice! Easy to use and very informative! Good format: short, fast and simple. All the information needed is available. Very helpful and easy to understand. Excellent project management courses. I especially like the short and easy lessons so you don't get overwhelmed.